Dr. Liu’s clinical specialties are clinical cytogenetics and clinical molecular genetics (ABMGG) for both constitutional genetic disorders in prenatal and postnatal settings and acquired genetic disorders including solid tumors and hematological neoplasms. Dr. Liu’s research interest is in translational medicine using genomic approaches to aid the understanding of the genetic and molecular etiologies of human diseases. 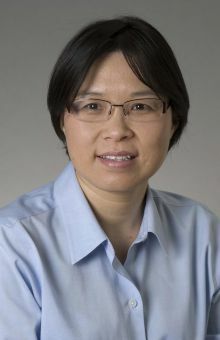 Projects in Dr. Liu’s laboratory currently include: (1) Next generation sequencing solutions for cytogenetics to characterize numerical and structural chromosomal aberrations as well as copy neutral absence/loss of heterozygosity in human diseases. (2) Understanding the biological causes for the discordance between diagnostic genetic test results and non-invasive prenatal screening (NIPS) using cell-free DNA (3) Using RNA-seq to characterize gene fusions and juxtapositions in cancer, especially novel fusions in sarcoma (4) Identifying new molecular markers for hepatocellular carcinoma with various etiologies. The main goals are to develop molecular diagnostics using both conventional genetics methods and new genomic approaches to aid in precision diagnostics for personalized care. Dr. Liu is also involved in the training of medical residents and fellows and at the University of Washington.